Parental note to self: Do not place large wooden swing set at the bottom of a huge sledding hill. Also, decline offers from neighbor kids to lend your kids their faster sleds. 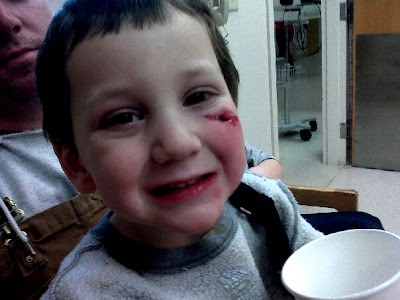 Asher ended up with a freakin' hole in his face yesterday afternoon. He cried some at home and on the way to the hospital but not once after we got there. Mostly he just smiled his beautiful smile. He allowed Aidan on the bed with him while we waited for the dr.
Aidan passed the time by hamming it up. Finally they started stitching him up and he fell asleep in the middle of it. Yes, he fell asleep! He got a chocolate sundae for dinner and then proceeded to fight with Aidan for the rest of the evening. Clearly a hole in the face can't curb sibling rivalry. That is one crazy injury!! I remember when my daughter had to get 17 stitches in her head when she fell off the monkey bars - she didn't cry during the stitches either! Kids are weird! Holy Batshit Sheepman! Nice gash ya have there! My middlest had her permanent tooth knocked out one year while at church at all places with a softball. She did better than I did when it came to the stitches! Good to see he was up and raring to go so quickly lol. OH no, haha, that IS a hole in his face! Poor guy!!! OUCH! That looks like it HURTS!! So glad it wasn't his eye!! OUCH!! That's some freakin' hole. Does he have a black eye now? I can so believe that they were good at the hospital and then fight as soon as they got home. Sounds just like my kids. GAH! That had to hurt! I'm sure it was no picnic for Mom, either, huh? OMG. MY face hurts just looking at that hole. Holy crap. I'm glad he's better.